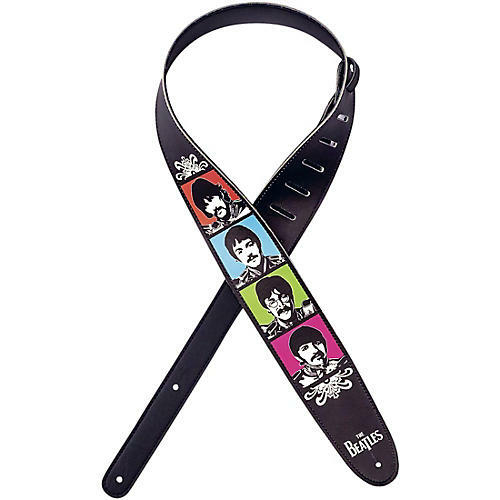 D'Addario Planet Waves Beatles Sgt Pepper Lonely Hearts Club Band 50th Anniversary Vegan Guitar Strap Sergeant Pepper's 2.5 in. The Beatles and D’Addario Accessories have "come together" to celebrate the 50th anniversary of Sgt. Pepper’s Lonely Hearts Club Band with limited edition guitar straps. Sgt. Pepper's has been called “the most important and influential rock and roll album ever recorded,” and Rolling Stone placed it at number 1 on their list of the “500 Greatest Albums of All Time”. While it’s earned these accolades for being musically groundbreaking, this album was also ahead of its time for being visually striking as well, featuring a the first-ever gatefold as opposed to a single vinyl sleeve that included eye-catching graphics.